*Please note: This show is now sold out. No tickets at the door. 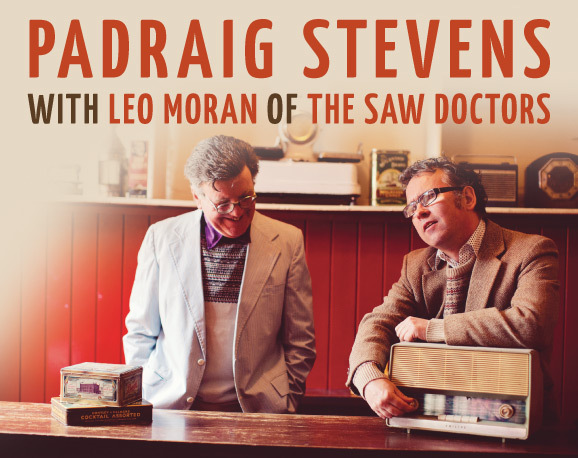 * We are excited to announce that Padraig Stevens with Leo Moran of The Saw Doctors will be playing at the ICC as part of their US tour to promote Padraig’s new album News From The Old Country. Thursday, October 11 at 7:00 pm (doors open at 5:30 pm) at the ICC’s Trinity Pub at 429 Morgan Road, West Springfield, MA. Dinner menu and bar will be available. Table or bar seating, general/shared seating layout. Sold out. Cost is $25 ICC Patrons / $30 general for the main dining room; $25 for seating in rear room off main dining room (some obstructed view). Read about the tour in the Irish Examiner. This is a rare treat to hear all new songs from Padraig Stevens, a prolific Galway songwriter, with Leo Moran supporting on guitar. Padraig’s songs have been recorded by The Saw Doctors, Christy Moore, Eleanor Shanley, and more. Listen to a preview the new album. “Greetings from Padraig in Tuam, Ireland. I was happy enough, enjoying my days. Sitting at home and writing songs. Then Leo arrived one day, wondering if I would be interested in doing a few little gigs with him. He had enjoyed playing the shows he had done with Anto – and later with Davy – but now he just wanted to play his guitar, and ‘would I sing some of my songs’, he said. This sounded good to me, so we started in February 2017 with gigs in The Kings Head, Galway and Campbell’s Tavern near Headford, both local venues. We got a great welcome at the shows, the audience enjoyed them, so did we! We did a few more gigs, things were getting better. Then we discovered we really needed to get some of our music recorded to let people know what to expect when they came to see us play. We went to Sun Street Studio Tuam where our old friend Ken Ralph whipped our sound into shape. With Leo steering we eventually released an album of songs called ‘News from the Old Country.’ Have a listen!